No coffee shop without some decent lunch options, right? Decent meaning yummy, filling, healthy. So what could fulfill these requirements better than a nice and fancy salad? 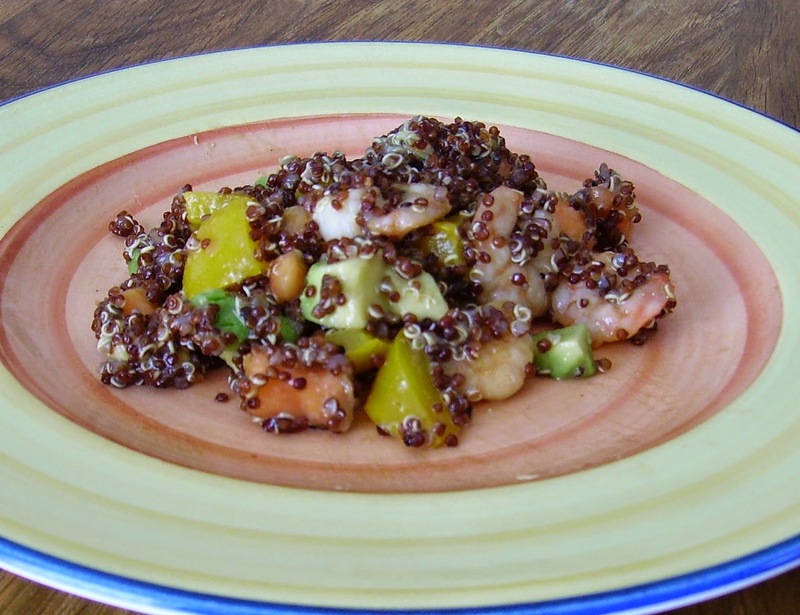 On the Quest with my friends through the culinary wonders of the world I arrived in the South American cuisines and took the challenge to create a new quinoa dish. My actual plan was to make something really sophisticated, something including quinoa, chocolate, papayas and heaven knows what else. But then I was in a hurry and needed a make ahead salad. I kept clinging on my extravagant plans for a very special and sophisticated, never before seen quinoa recipe, until DH and I inhaled the quick make ahead salad. "Oh," he said, "this is great! You have to post it!" So my fancy ideas still linger somewhere in the ether of unborn masterpieces. Maybe I'll give birth to them some time in the future. Rinse quinoa under hot water, then cook in 1 cup of water for about 15 minutes or until all the liquid is soaked up and the grains are soft. Place cooked quinoa in a large salad bowl, add 1/2 teaspoon salt, mix well. In a frying pan, heat olive oil and fry diced bell pepper until lightly browned, add salt and pepper to taste. 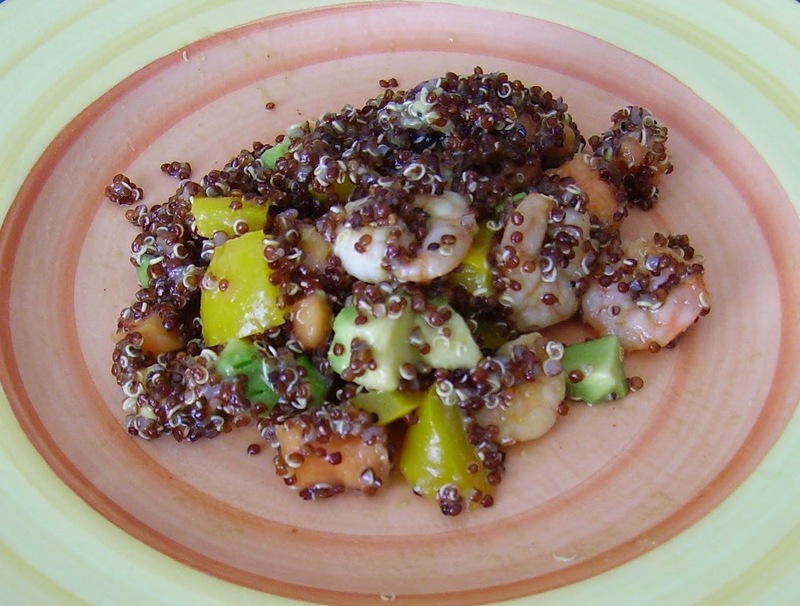 Dump browned bell pepper from pan into the quinoa and add some more oil to the pan, re-heat and add the shrimps, fry until pink, then add a dash salt and 1 tablespoon honey. Stir well to coat the shrimps evenly with honey, fry until they start to brown a little (that's the caramelizing honey), and deglaze with 1/2 of the lime juice. Continue frying for some seconds, until the liquid has become a syrup, then dump shrimps into the quinoa, too, scraping from the pan all the juice. Add the rest of the lime juice and another 1/2 tablespoon of honey to the quinoa, mix well and let stand at room temperature for 1 hour. Add diced avocado and papaya, mix well and serve! 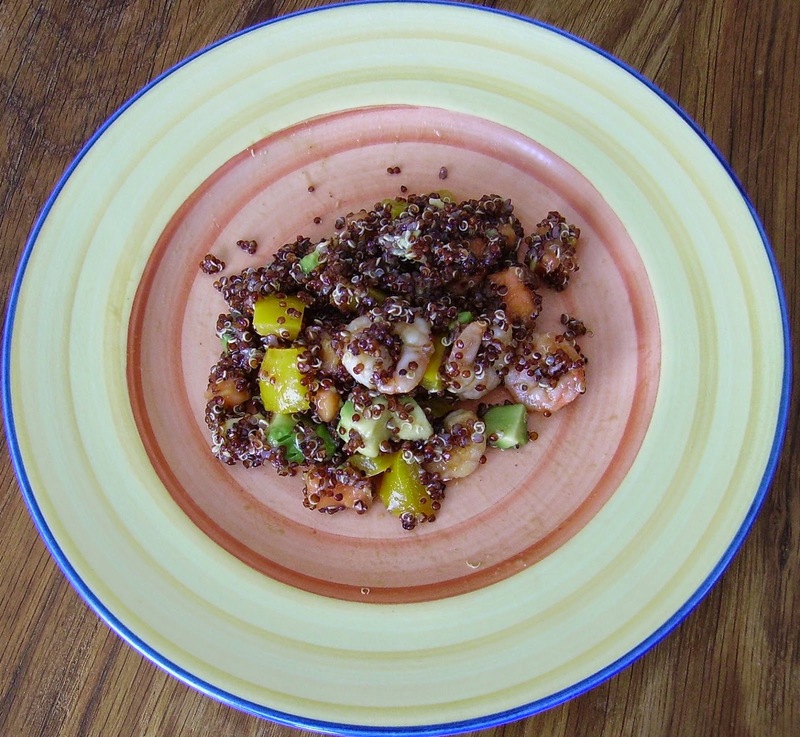 Have you ever tried red quinoa? This was my first time, and I realized that it needs the rinsing in advance more than the white quinoa. I'm not sure if it is more aromatic or if the colour deceives the taste buds, but I definitely liked it. Plus, it adds some more antioxidants (red colour)!